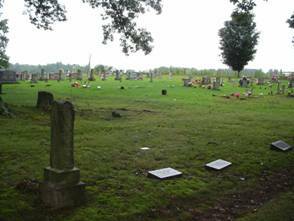 The Jackson Cemetery is located on the east side of Jackson Cemetery Road, about six miles south of Collinwood and 1 mile east of the Natchez Trace Parkway. Decoration day at the Jackson Cemetery is the first Sunday in July. NOTE: John Allen Berry enumerated this cemetery. He offered to allow me to post it on this website and I was happy to do so. With his permission, it has been currently re-formatted to conform with the other listings on this web site. If there are any questions or comments, click on his name with the underline beneath it above. Martin, Harvey; b. 10 Mar 1894, d. 19 Jan 1967, Georgia Pvt. WWI 38th  Inf. Cody, Louisa; b. 18 Apr 1882, d. 03 Oct 1882, daughter of G.W. & R.L. Jackson, N.E. ; b. 28 Mar 1877, d. 05 Apr 1904, wife of J.A. Berry, Malissie; b. 17 Sep 1865, d. 08 Nov 1914, wife of J.D. Berry, R.L. ; b. 18 Mar 1877, d. 13 Jan 1908, daughter of I.B. & A.J. O’Bryant, Minnie P.; b. 16 Apr 1906, d. 08 Feb 1931, daughter of J.R. & M.B. O’Bryant, Griffie C.; b. 13 Oct 1904, d. 02 Jan 1928, son of J.R. & M.B. O’Bryant, Effie Estel; b. 17 Jun 1907, d. 12 Dec 1911, daughter of J.R. & M.B.